I was a little shocked when I came across this ADHD alternative treatment video game. Video games as ADHD treatments? Don't they make ADHD worse? Sounds crazy, I know. You have to check it out for yourself. According to research, playing video games can make ADHD worse. 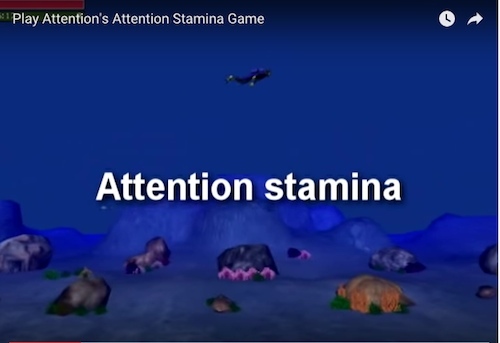 Playattention.com quoted a study that showed cognitive games that allegedly help ADHD, doesn't help and can make it worse. Those other games don't monitor what is happening within the brain so its effectiveness can't be adjusted. That is where playattention is different. It monitors the activity and makes sure the attention is paid to the game. For all the processes going on with the game, the company owns 5 patents. We have helped many thousands of people with attention problems change their lives. Play Attention was developed by a teacher who faced the same struggles you're facing right now. Inspired by NASA technology, Play Attention uses powerful advancements of neurofeedback technology that allow you to control the computer by mind/attention alone. This technology strengthens your mind so you control your mind, it doesn't control you. Play Attention is used globally in more schools and homes than any other educational, cognitive, and behavioral program. Find out what everyone else already knows. Call 800.788.6786. You can use their system at home for just 1 hour a week. You might think it is for children only, but it is for adults as well. When the system first came out, it was $4000. I don't remember if that was the professional user cost or home user. It currently starts at $180 a month. To learn more about it, visit www.playattention.com.